Magical Manifestations of Magnanimous Mind! Location – location – location – shifting process has energized you and consolidated the opposing forces of your mind – twin minds. Your past experiences – intellect evolved with them – and is now in tune with universal consciousness – you no longer run towards seclusion as well as are fine with seclusion – you no longer hate wisdom as well as look for practical approach. You no longer wait for things to happen on their own as well as are fine with patience. You are now on that Zero point – the balanced poise – where you jump from zero to infinity. Why Infinite wants you to work out all left and right modalities of life? So that you can rise above both and can see the ONE divine point of view and live life accordingly – as per plan – in flow – in surrender – actually you let your Self live as the ONE on this planet – rather than a mutilated version of the Self. This was your own (MY) idea to evolve by separating me from ME and bring back to ME after certain period of evolution whereby I get acquainted to all basic rules of the game – science and arts – to understand all spectrums of LIFE. Now you progress to REAL REALITY – you plan and design – and I AM rest assured that you have compassion as the basic drive for sure. Enough said and done. Enough witnessed and memorized. Enough enormous mistakes made – sensible to insensible. Enough blame games played. Enough of your tools to colorize your boring black and white movie. ENOUGH! Now let the MAGIC begin. Manifestations – Acceptance – God – Instant – Comprehensible. Mega structures created by magnanimous mind. Now BELIEVE in what you really are. That monstrous BEING. Nothing is incomprehensible or impossible to the real you. Let ME be Amitt and live trillion times more miraculous mindful life full of extra ordinary adventures and expressions that only one could dream of having in this dimension. Let us now move mountains! Yes! Mountains! Real ones! Not imagination, not a parable. Reality. Who moved my mountain? – i – AMitt [i – AM – Totality Transcended]. The gap between solid – astral – causal – divine will collapse and you ‘will’ and it ‘will’ manifest – HERE NOW!!! Is my Higher Self my sub-conscious mind only? Amitt – the real Self and the reality both are Amitt (meaning endless) – infinitely infinite – unfathomable. Subconscious is a part of that Oneness – an inseparable part – mechanics set to run this machine (body) and create a world of your choices and beliefs – till you master it all – from backwards to foreword – from that reptilian (oldest brain) to higher consciousness – and integrate it all – as one holistic mind – thereby consciously able to create your world in an instant – from make -> believe to believe -> make! A smart shift from working backwards to working forwards. You can materialize anything by keeping the vibrations of love as base and programming your subconscious reality based upon it – using power of now – the belief – but you need much more than that – you need a mind to be able to create something you can’t imagine – a greater mind of miraculous manifestations – how about manifesting a planet? Can you believe it? Do you have that energy and insights and accuracies and experience (to manifest a planet?) I offer you infinite power – trillions of times more than your sub-conscious mind – which is accumulation of your experiences and expressions – of course it’s a projector (manifesting your world) – but you need to be able to stay far away from all above – above the projector and the scene – above the actor – to enjoy and learn – express and evolve – from the highest seat of witness/infinite consciousness – and you design and produce – play and see – be the scene and the experience – all at once – in uncountable number of life forms and universes – simultaneously – impossible? I M POSSIBLE! NO. Capital NO (in answer to the question). I AM not only this tiny limited sub conscious mind. I AM the mind who designed this holographic device (brain) – sense organs – the world story (manifest world). I AM The One and the only One – integral ONE – Absolute One – undestroyable non-changing ever-changing – ALL THAT is, was and will be – GOD and more – beyond comprehension of even your gods and goddesses, messiahs and all enlightened masters – beyond your capacity to imagine my size, my ideas, my thoughts, my desires, my form, my name, my image, my consciousness – beyond all beyonds – where doubts stop – thoughts stop – questions stop – you loose yourself – I AM THAT SILENCE! 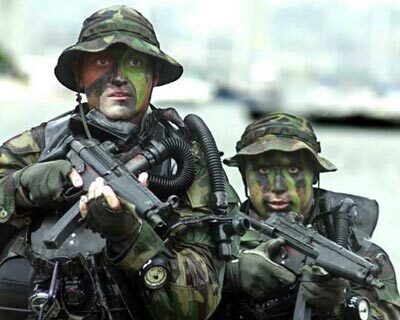 Fit for SEAL Commando training? Evolution of a species receives mixed response from individual beings of that species. Some opt to retain the old blue-print forever, some accept changes to some extent and opt to keep it ‘as-it-is’ for some aspect of life, few adopt the changes and look for opportunities for growth but with some hiccups get frustrated and find themselves confused whether to go ahead or fall back and very very few talented committed individuals desiring speedy evolution accept the changes in totality and adopt themselves completely even accepting the challenges boldly and facing them squarely – fit individuals for speedy Integral Evolution. That’s what I have in store for you – challenges and more challenges – difficulties to overcome – its more like the famous SEAL commando training. The more vigorous and challenging training you undergo, the faster, smarter & invincible you become. Body training, mind training or soul training. Challenges are meant to be challenging – and for integral evolution – my challenges include physical stamina, mental fitness and maturity, emotional balance, ability to remain balanced in worst case scenario, equanimity, faith/surrender to higher forces, spiritual caliber and level of awareness/consciousness. Having undergone several of such training programs, you become eligible to enter into the zone of Oneness – as Oneness Revolutionary. Now you are ready to operate and train others – along with your own speedy evolution – to greater heights and depths – witnessing all with your newly developed Right Vision with sharp penetrating awareness – which throws light into the darkest zone and illuminates it – deciphering most complex codes and making them available/accessible for common beings – for its overall development. That’s your task – the only task – for which you feel the kick from within – to get up and get going – a burning passion – never tired nor bored from doing this task – my dear, Oneness Commando! Be Truthful – at any cost, at any time, at any place, with anyone, for anything, in any dimension – as a being of Truth – sparkling truth! You do not judge others as truthful or not – you do not care about truths set up by society, media, gurus, scriptures or messengers of God. You know your own truth – instinctively – and you follow your truth – that’s your dharma – true religion even above so called spirituality – that is sanatan dharma – to act, think, talk, walk on the path of eternal truth as revealed by life to you in this moment, right here, right now. Be with this truthful moment – for this is the only moment existing right now- and so this is the only universal truth right now – and be with it – whole heartedly – with complete mind – with total co-operation of body – this Integral Truth of this moment – will liberate you – moment to moment – thereby paving the way for The Truthful Warrior – The Truthful Sage – The Truthful Scientist – The Truthful Player – The Truthful Businessman – The Truthful Tyrant! Each role is the truth of the moment for that being as ‘guided’ by the life to experience, explore, express and evolve from that – to find another truthful moment – to live and expand into eternity. Every task, every thought, every word and every evolutionary leap is a direct invitation to The Truth – to experiment with life and find your own higher, wider, deeper, integral version of truth. Joyful, conscious (aware) and truthful living is the secret of all secrets – a divine life. That is the way – The Tao – learn it, digest it and live it – and The Truth – is with you forever ever.